Arizona pour le plaisir dans le soleil. Bungalow meublé à la disposition de certains snowbirds heureux ou pour ceux qui ont juste l'envie d'aller jouer au golf. Notre maison a 3 chambres à coucher, le maître a un lit king et salle de bains / la deuxième chambre a un lit queen et le troisième un jumeau. Il existe un bain supplémentaire entre la deuxième et la troisième chambre. Tous les meubles dans la zone de la chambre / salon à manger est nouvelle avec tous les nouveaux appareils de cuisine et laveuse et sécheuse. Les armoires de cuisine et de granit ont été remplacés novembre 2013. Tous les planchers est tuile ou stratifié. La maison se trouve à 25 minutes en voiture de l’aéroport de Phoenix, à proximité de nombreux magasins, restaurants, parcours de golf, centre commercial Arrowhead, 303 autoroute, stade surprise - patrie des Texas Rangers et de Kansas City Royals, stade de l’Université de Phoenix. Nous ne pouvons pas accueillir les chats, mais considérons les petits chiens non-perdants. REMARQUE: nous ne sommes pas en mesure de louer notre maison de vacances pendant moins de 30 jours en raison de nos règlements municipaux relatifs à la HOA. I can’t say enough about Gerry and Deb, when a medical condition held us back from getting to the house, they extended the end date for us...thank you thank you thank you! The house was great, clean and perfect for our needs! Would definitely recommend this property! This home exceeded our expectations...it was very nice, clean, and well-stocked. The king bed and all furniture was cozy and inviting. The private backyard, pool, and hot tub were beautiful. It's in a nice neighborhood, has a great dog park area, and is close to lots of shopping and restaurants. Gerry and Deb we're excellent hosts! We experienced no problems, and would highly recommend this home! We are extremely happy that you enjoyed our home and welcome you back anytime. Thank you, we are extremely happy you enjoyed your vacation at our home. This was our 2nd year to rent this property. Gerry & Deb are excellent to work with and always available to answer any questions. This home is easy and conveniently located for all your sightseeing and adventures. The house is always clean and well maintained. One of our favorite spots is the back patio pool and spa area. It's peaceful for relaxing and private with the cement block wall around it. Our stay was once again January, February and March 2017. Everything about the house was very comfortable & it is conveniently located for all our exploring & adventures. It was clean, updated & a recently remodeled modern kitchen. We enjoyed the patio with the pool & we used the hot tub often. We walked the neighborhood often & found the neighbors to be extremely friendly & helpful. The owners were extremely welcoming & eager to make our winter stay as pleasant as possible. We totally enjoyed our stay & are looking forward to our return in 2017. With all the updates and upgrades we have completed on our property, it was a pleasure to have clients that treated it as their own home. We welcome you back anytime. With so many properties in the area we appreciate that you have enjoyed your stay with us and are coming back again next year. We reserved the home for 2 months and ended up staying 5 while waiting for a new house to be built. The owners were very cooperative and responded within hours to our requests (extending stay or minor questions). We were there during the hot summer and were in and around the pool most days. It's clean and inviting! The neighborhood is quiet and neighbors are friendly. The green belt area is just around the corner and we walked the neighborhood frequently. We were somewhat familiar with the Phoenix/Scottsdale area, but found this home to be well located. Lots of shopping of all types close by and easy hops to Scottsdale or Phoenix. The master bed was super comfortable and appliances and kitchen newly updated. 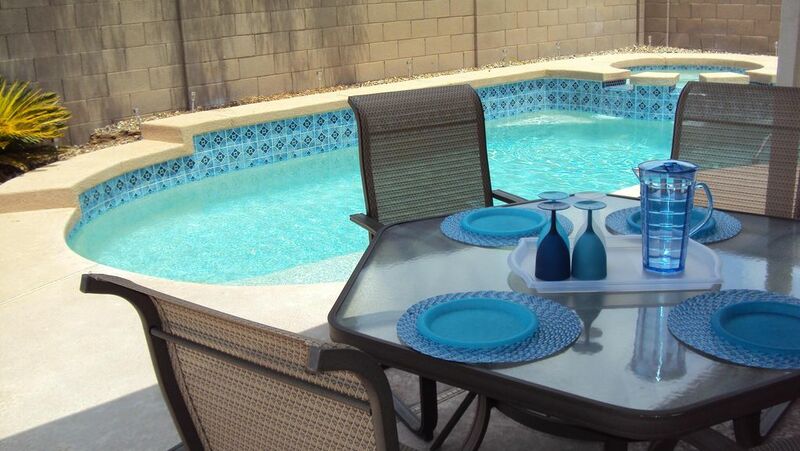 We would not hesitate to recommend this home to friends or others looking for a place to stay in the Phoenix area. Thank you for your kind words, you were fabulous clients. Enjoy your new home in the area.